Growing client base leads to dedicated expansion in California. January 25, 2014 Roscoe NY– The Beaverkill Rod Company, Inc., a leading manufacturer of premium American Made Fly Rods, today announced that it will be expanding their distribution model in the West Coast. In response to the growing success of their existing West Coast Sales, and the traction of its current product line and mission, West Coast presence will now include a dedicated sales team and account services within that territory. This West Coast expansion comes on the heels of the recently completed expansion at their corporate headquarters in New York. Beaverkill has seen tremendous growth in interest for their current “Legacy” fly rod offerings, innovative tech gear, merchandise and blank sales from anglers, guides, lodges, fly shops, and custom rod builders based on the West Coast since opening operations July 2012. That interest has quickly translated into increased sales and a formidable customer base in that area. Recognizing the growth in this region, BKROD is expanding its presence to include dedicated account service personnel, a state of the art rod building facility, and a robust inventory of the complete line of Beaverkill products to support the existing infrastructure of Sales and Marketing efforts within that territory. The expansions progress will be overseen by Nathan Niebergall. Nathan has been working closely with the president of the Beaverkill Rod Co., Anthony Magardino, for over a year establishing a business strategy, and plan moving forward to execute a successful launch for this exciting new expansion. Born in 2001, with a passion to manufacture the finest graphite multi-action fly rods, our mission is to manufacture our entire line of rods onshore in the USA, and also be able to finally offer every angler an affordable alternative. Beaverkill Rod Co. is unwavering in their support of all past and present U.S. veterans whom have protected the sovereignty our great nation. 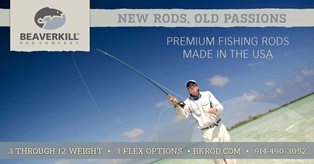 Beaverkill Rods (www.bkrod.com) is headquartered in New York, U.S.A.